Pierre Angenieux (of Paris) lens. New, but very old. Bonnette N 3. Zoom 10 x 12. Gates P/N: 727-0184-000. Includes the box (pictured). 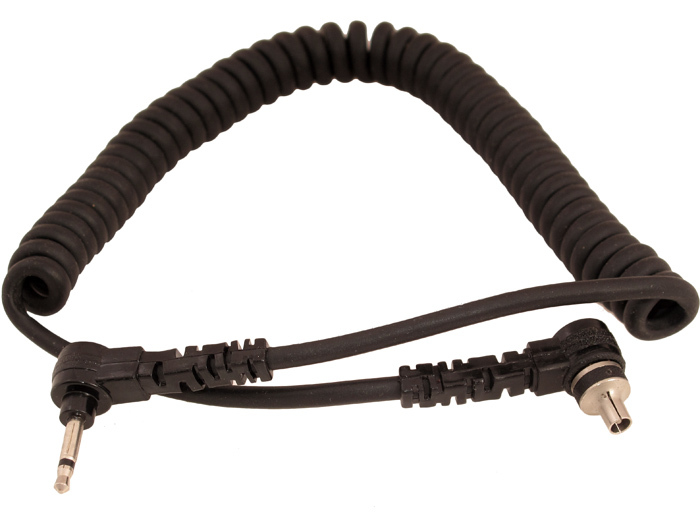 Coiled cable 14" long (relaxed), 40" long (extended) 2.5mm subminiature plug on 1 end, coaxial plug opposite end. 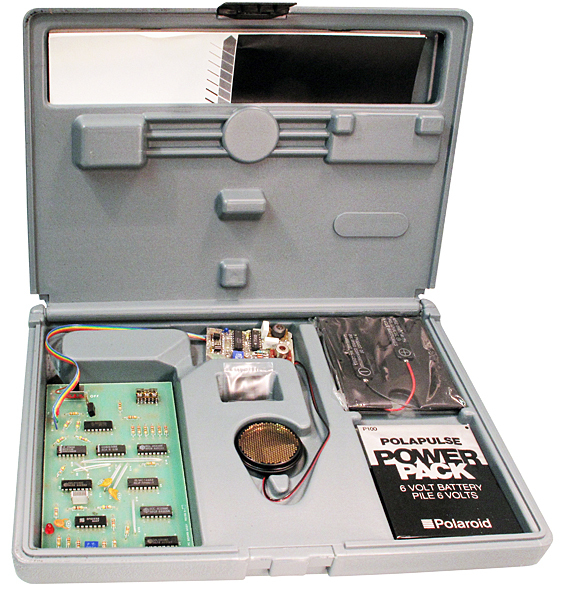 Polaroid® ultrasonic ranging system designer's kit. New, unsused. Very Rare!! Not state of the art by today's standards but is a fabulous window on a historical stepping stone in camera auto-focus systems. Includes manuals. J.H. Bunnell film re-winder or code tape. Winds up on back like a manual clock. 5/8" wide tape, 6" diameter spool. Made in the 1940's(?). Brand new in the original box. Kodak No. 2 film pack Hawk-eye. Several dents, missing strap, broken glass on top. 2-1/4" x 3-1/4". Made in 1922. Sears light meter. Excellent condition. 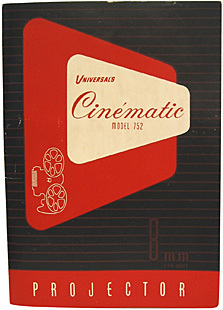 Universal Cinematic P-752 8mm projector. Made in 1948. Looks new with original box and manual. 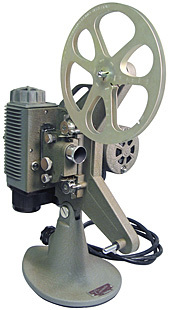 Step back in time and show those old 8mm home movies with this vintage projector. A rare find!! The "Perfecscope" stereo viewer. 27 cards included. James M. Davis Agent 21 Washington Pl. New York U.S.A. The stereo view is actually a twin photograph with two images mounted side by side. Each picture has been taken from a slightly different viewpoint corresponding approximately to the spacing of the eyes. When looked at through this special viewer, the left eye only sees the left photograph and the right eye its corresponding half. The view suddenly springs to life as a stereoscopic or three dimensional image. It is like looking through a window into the past with the impact of the third dimension giving realism. On the silver frontal piece there are scroll designs and an emblem with figures of a woman and man and the words: Exposition Universelle Internationale 1900, H.C. White Co.
Eastman Kodak Micro-File Recordak Model E, power supply and camera + accessories all tucked into 22" x 27" x 7-3/4" suitcase. Originally built in 1938 and then rebuilt in 1950 by Baltimore Signal Depot. Includes 63mm Ektar Lens. Power input 100-125 vac 1000 watts. Has 0-130 vac voltmeter. Surprisingly excellent condition. 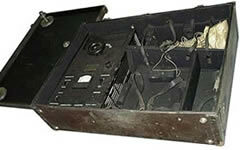 Miniature projector made by Society For Visual Education, Inc. Model AK, 120 vac, 300 watts. Again, old, very old. Kodak Ektralux Flash Holder NEW IN THE BOX! Two pieces. Surplus Sales also has a couple cases of old "Carbon Arcs" used in the silent movie days. It made the flicker. Also an old 20mm Goldberg Brothers Film Rewinder.